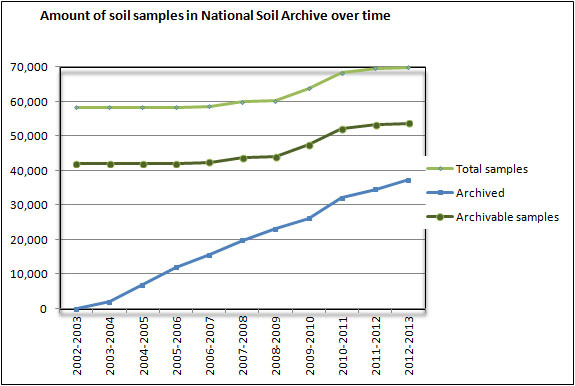 What is the CSIRO National Soil Archive? The CSIRO National Soil Archive is a facility in Canberra where soil specimens and soil data are stored and where archiving takes place. The Archive stores 70,000 soil specimens that were collected for the purpose of soil research from around 9,500 sites Australia-wide. These soil specimens are invaluable “time capsules” for assessing temporal changes in soil properties, particularly as new analytical tools become available. The collection of soil specimens is accompanied by an extensive database named NatSoil. The locations of the soil sites can be viewed in the Australian Soil Resource Information System (ASRIS). Site reports containing soil morphology and soil chemistry can be viewed or downloaded. Read the online help if you are unfamiliar with the ASRIS interactive map viewer. 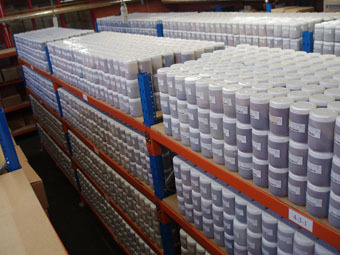 In 2003, the soil specimen collections from the CSIRO Land and Water Divisions in Brisbane, Townsville, Adelaide, Hobart and Perth were sent to Canberra. 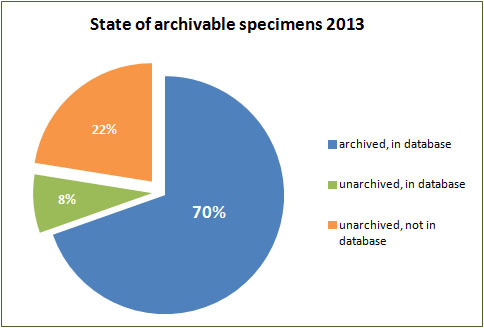 While the vast majority of specimens have been collected by CSIRO, many thousands of specimens have been acquired as orphaned collections that were submitted by other organisations, predominantly State Agencies.In 2013, 5,400 of the 9,500 sites with soil specimens in the Archive had been archived. 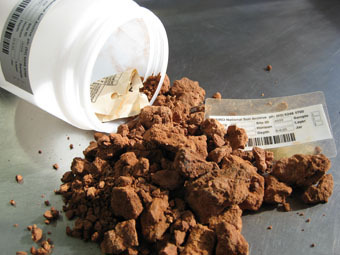 Archiving of stored soil specimens is an on-going core activity. The mission of the CSIRO National Archive is to provide facilities and protocols for conserving the long-term scientific value of soil specimens and associated soil data, and to make these specimens and their data available for public research, both now and into the future. The CSIRO National Soil Archive is supported in its mission by the Australian Collaborative Land Evaluation Program (ACLEP) and the National Committee on Soil and Terrain (NCST). Priorities for the Committee Priorities are to ensure fair and equitable access and use of soil specimens now and in the future; to oversee and regulate operational activities to ensure integrity of specimens and to facilitate support and promote the CSIRO National Soil Archive as an important national archive. For more information on archive management click here. Soil specimens and their associated data form the core of the Soil Archive. There are two types of soil specimens in the Archive, unarchived soil specimens and archived soil specimens. Archiving of stored soil specimens is ongoing. The CSIRO National Soil Archive contains 70,000 soil specimens in total, of which 53,000 can be archived and have verifiable locational data. 16,000 specimens do not have verifiable locational data, but are exceptionally well-ordered and documented. These are mainly South Australian specimens dating back to the first half of last century. 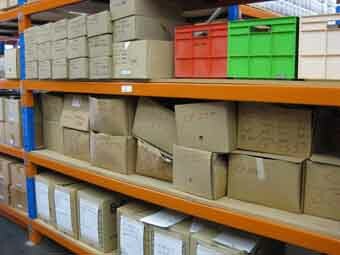 Archiving involves stocktaking, labelling and transfer of soil material. Specimens are delivered to the Archive in varying degrees of disorder. Field collection may have occurred 50 or 2 years ago, either from a soil pit or from using an auger. The soil material was air-dried soon after collection, often, but not always, passed through a 2 mm sieve, and sub sampled for chemical and physical or mineralogical analysis. Part or the entire specimen may have been ground. Data may be present in an old data format, only in print, or in an up to date database. Archiving of soil specimens involves data entry, stocktaking, labelling and transfer of soil material into 1 liter, PE plastic jars. For each archived specimen archive information is available in the database: how much material is present, whether the material is present as whole soil or fine earth (< 2mm), and on which shelf it can be found. On every archive specimen, the label indicates the agency, project, observation ID, site ID, horizon (name), depth, sample (where there are more specimens per horizon) and layer. Together these variables provide a unique ID for every specimen, which is expressed in the barcode on the label. The associated data adds considerable value to the archived soil specimens. At the time of field collection, information about the location, land use and the collector itself is recorded. After collection and sample preparation, laboratory analyses provide chemical soil properties, although which properties are measured can vary from project to project. Because different laboratory methods return different results for many soil attributes, especially nutrient availability and some physical attributes, great care is taken to reflect this information in the database. Soil chemical analyses commonly conducted include pH, electrical conductivity (EC)), exchangeable cations, exchangeable aluminium, extractable potassium, phosphorus, sulphur, aluminium, iron, copper and zinc, ammonium-, nitrate- and total nitrogen, organic carbon and manganese. Less commonly, inorganic carbon, lead, zinc, cadmium, copper, mercury, cobalt, molybdenum, arsenic, chromium and nickel were determined. Soil physical analyses were conducted less often because they are very labour- intensive and hence expensive. Soil physical analyses may include particle size distribution, bulk density, soil strength or structural stability. Hydraulic conductivity and water retention characteristics may be measured, in which case water content at field capacity, water content at wilting point, total available water content, total soil porosity and air-filled porosity of the soil at field capacity are known. Soil mineralogy data may also be present. Micro morphological information from techniques such as microscopic observation, thermo luminescence dating, scanning electron microscopy (SEM), x-ray diffraction, grain counts, and electron probe microanalysis may be available. The database holding all data, called NatSoil, is valuable in its own right. It is often the starting point for future investigations. Querying the database to select specimens based on certain soil properties, then re-analysing these soil specimens for other soil properties is the most common way in which the archived soil samples are currently being used. New soil data are always being added to the database. The specimen collection of the Archive reflects the changes in research focus over the last 50 years. While the older specimens stored by the CSIRO National Soil Archive (from the 1920’s and the 1930’s) do not have location data of the currently required accuracy and are therefore not archivable, that part of the collection can still be used, if one is familiar with the publications. These specimens were collected prior to widespread application of pesticides and herbicides and before the start of nuclear testing in 1945. Archived soil specimens are invaluable “time capsules” for assessing temporal changes in soil properties, particularly as new analytical tools become available. 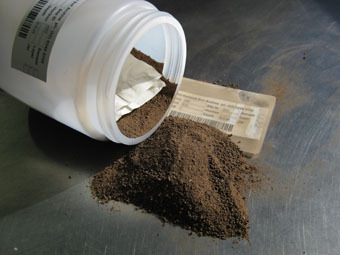 Archiving of stored soil specimens is an on-going core activity. New soil specimens are being submitted to the Soil Archive regularly. The Department of Agriculture and Food WA has just submitted around 2500 soil samples that were collected during a mapping exercise in Western Australia conducted during the late 1980’s to the 1990’s. The Agricultural Production Systems Research Unit (APSRU), is submitting hundreds of soil samples from agricultural land in various States, for which good soil physical and chemical soil data is available. The Soil Condition Evaluation and Monitoring Project (SCEAM) in Tasmania, which commenced in 2004, has 100 long-term reference sites, which will be revisited every 5 years. The soil specimens are submitted to the CSIRO National Soil Archive. To maintain important historic and contemporary soil specimens from around Australia for future analysis, the CSIRO National Archive supports continuing submission of additional collections of soil specimens to expand the Archive collection where possible. Specimens submitted to the CSIRO National Soil Archive are required to meet a number of criteria to become part of the collection. Organisations wanting to submit soil specimens need to describe (using the Submission Form), the type and number of specimens, the amount of material per specimen, the amount of data, the data format, and the research to which these specimens contributed and justifications for archiving. Upon receiving this request, the CSIRO National Soil Archive Committee will review and assess the submission. For more information on submissions click here. 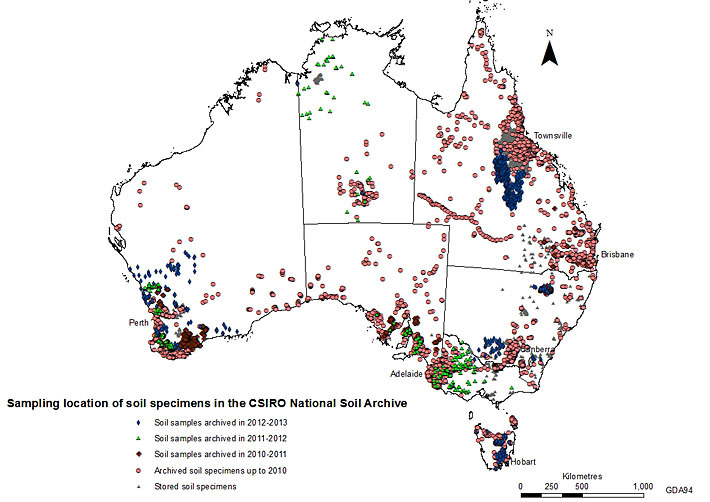 The CSIRO National Soil Archive balances the preservation of historic soil specimens and associated soil data (for future research) with the role of making these soil specimens and associated data available for current public research. Potential users of the archived soil specimens must adhere to the Archive guidelines as a matter of common courtesy and ethical responsibility. The archived soil specimens have been collected for the purposes of scientific research. Therefore, they are expected to be subject to treatments and analytical procedures required to advance science, at the discretion of the CSIRO National Soil Archive Steering Committee, even if this results in consumption or alteration of the specimen. Users need to be keenly aware however, that the quantity of soil material per specimen is limited, and exercise particular restraint when analysis is destructive. For more information on use click here. Non-destructive analyses of the archived samples using Infrared Spectroscopy offers great opportunities. Raphael Viscarra Rossel from CSIRO Land and Water in Canberra has been an important user of the archived collection in order to develop a national soil diffuse reflectance spectral library. He is developing national scale digital soil mapping of mineral and organic composition using spectra of archived soil samples. For more information on mid Infrared Soil Analysis click here. Video - "A valuable time capsule"